But they shoo the cleaners out of there before we actually go completely postal, and we do actually make the Cologne train. This time the attendant puts me in a cage and turns a handle to raise the cage till it’s level with the train and I can be pulled in without lifting. What won’t they think of next! I note that the express train zips nonstop very fast through Liege-Palais station without stopping. Hmmm. In Cologne our hotel – Hotel Commerz - is just over the road from the station – practically under the forecourt. This means that if we just head through the station we’re at the cathedral, the station tracks being about thirty feet from the high altar. I wonder why they thought that was a good idea? You can see the cathedral from our room, in fact. Sort of. Over the station. We drop our bags and wander around the quite enormous cathedral. It’s Sunday, which means that some antisocial people are having a ceremony of some description up the far end and have shut it off. Still, there’s a lot left. 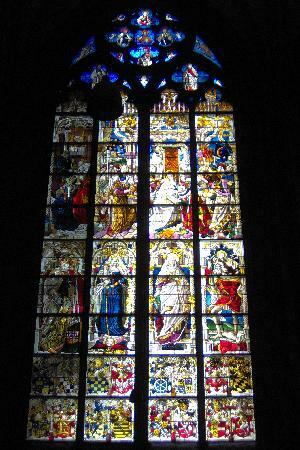 They get their stained glass by the hectare in this part of the world. The station has a food hall, so we eat some takeaway pork dishes with sauerkraut. Eventually it turns out I can sleep on top of cushions piled just a certain way. After breakfast we link up with Anke, one of our old DEAL interns, who has taken a very fast train in from Manneheim to meet us. We walk down the Rhine bank to the Chocolate Museum. The architecture, I have to say, is a little dull; as in Aachen, there seem to be very few buildings older than 1944. They must have had a vigorous slum reclamation program, or something. The Chocolate Museum is very informative, and we spend nearly as much time in the museum as we do in the café and almost as much time in the café as we do in the gift shop. I can’t even eat the cakes, though. Tantalising. We hurry back in the rain, a rarity for the trip overall. That evening Dagmar, another old DEAL intern, comes to the hotel for drinks and chats about old times. After classic German breakfast of sausage and cheese we head over to the Ludwig museum of modern art, just behind the cathedral. They’re having a Roy Lichenstein retrospective. Also lots of Russian Constructivism, which does seem to be following me around the world. I have some trouble staying awake. When did I last sleep a whole night? Back to the hotel to grab our bags and then on to the train to Frankfurt airport and plane to Singapore. In Singapore our hotel is not just next to the airport, you don’t have to go outside to get to it. And there’s a very good Chinese food hall. A four-hour flight over inland Australia. For three hours of that we don’t see a river. Or a cloud. We’re a very dry country. With some relief, then, back home. Well, it was a rough trip, and a lot of things went wrong, but we did get a lot done, and we did miss several weeks of the federal election, and several weeks of the AFL season, So I suppose it was a blessing in disguise. Do you want to go back to the start? I certainly don't.